Earning Big Payday The Right Way, Well-Deserving Tillman Makes Right Decision: The Bears re-signed a key member, keeping intact their core group on defense for many years to come in the Windy City, as former Louisiana-Lafayette CB Charles Tillman agreed to papers on a six-year contract extension through 2013. This Rajun Cajun’s deal is worth $41.5 million, with $18.5 million coming in guarantees. It comes after the Bears CB Nate Vasher re-upped for five years at around $6 million dollars a year. Expect one of the NFL’s Top DT’s in the league, Tommie Harris, to be the next in line to ink another long-term contract extension for the Monsters of the Midway. 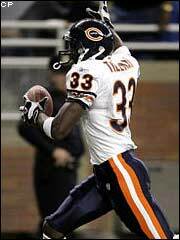 Charles Tillman, a Chicago native, has appeared in 53 games, along with four contests in the playoffs, with 49 starts in four seasons since becoming a Chicago Bear as a second-round pick (35th overall) in the 2003 NFL Draft. The 6-1, 196-pound physical specimen at the LCB spot (positioned to match up against the other team’s best WR) caught five passes from the opposition last season for the second straight year, increasing his career total to 14, second among current Bears behind teammate cornerback Nate Vasher (16 interceptions.) He led the team with 11 pass breakups and is the Bears third leading tackler next to Urlacher and Briggs. Charles Tillman had this to say after the signing: “I’m glad to remain in Chicago,” Tillman said during a teleconference. “I like playing for coach [Lovie] Smith. I like my teammates. I love the organization and I like the city, so it feels good.” Tillman, who was scheduled to become an unrestricted free agent following the 2007 season, is the fourth Bears starter since last summer to ink a long-term deal before hitting the free-agent market. He follows center Olin Kreutz, linebacker Hunter Hillenmeyer and cornerback Nate Vasher, who signed a five-year extension a little more than a month ago. “I commend the Bears for doing a great job of getting it done and my agent as well,” Tillman said. “They compromised; we compromised. No one was big-headed. They were willing to listen; we were willing to listen, and I think that’s how the deal ultimately got done.” (Are you listening Lance ?!?) Tillman and Vasher combine as the only cornerback duo in the NFL to each record double-digit picks with the same team over the past two seasons, and their 21 interceptions together during that period are the most by any NFC cornerback 1-2 punch. “I’m proud of Nate for getting his deal done when his got done and I’m glad mine has gotten done,” Tillman said. “Nate and I work well together and I’m just glad to be on his team.” Tillman is a huge part of the Bears team that has won 24 of 32 regular-season games in grabbing back-to-back division championships for the first time since the Walter Payton and Mike Ditka era in the 80s. Signing CB Charles Tillman right before Training Camp was another brilliant decision, in a long list of good moves made by GM Jerry Angelo. Tommie Harris will be the next player signed (likely before preseason starts), with WR Bernard Berrian and QB Rex Grossman waiting in line for new deals during the ’08 off-season. Tillman is a Top 10 CB in my opinion and makes plays consistently as a sure tackler (over 300 career tackles) in a Bears secondary that forces a lot of turnovers, leading the NFL in that department. He has a knack for finding the ball, being in position to create a takeaway, going the distance on either a pick or fumble. He definitely has a nose for the pigskin, returning many interceptions for big gains, turning the field position edge in favor of the Bears, and he makes sure he is there every Sunday causing trouble for opposing offensive coordinators, quarterbacks, and wide receivers as a disruptive force on the best playmaking defense in the NFL.